When I was coming up with this recipe, it was originally just for a creamy sweet dressing, and has since evolved into one of my favorite creations yet. I have had a package of golden raisins in my pantry for longer than I care to admit and I wanted to utilize their sweetness in a more interesting way then plopping them onto my oatmeal. Because my raisins were not the freshest, I soaked them in boiling water to revive them a bit. Blending them was my best bet to really enhance their flavor. Using pine nuts, which is already a classic pairing with golden raisins, created a luxuriously smooth and creamy dressing without any additional oil. 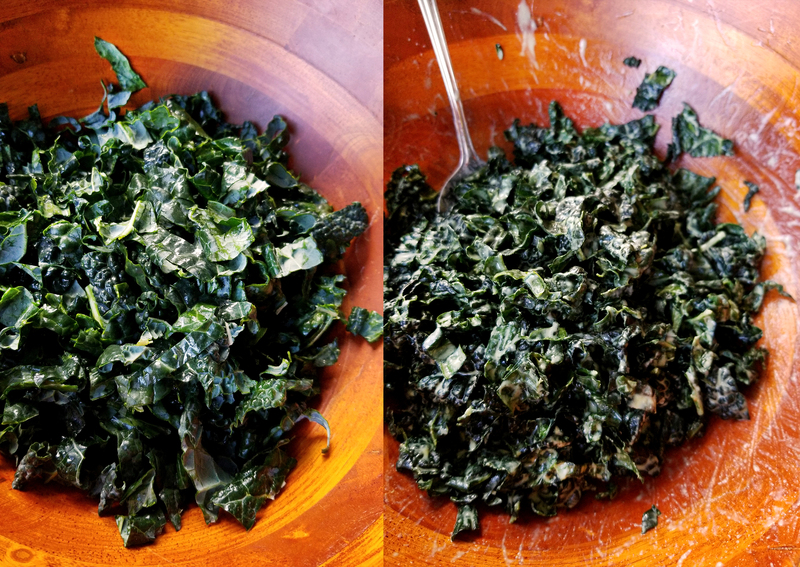 With some shallot, garlic, and mustard I had my hands on a killer salad dressing that can be poured over just about anything you could dream of. This dressing is particularly suited for hardy, spicy, and even bitter vegetables because of the overall sweetness of the raisins. Enter Kale. The hardy, bitter, hippie love child of today’s “superfood” frenzy. 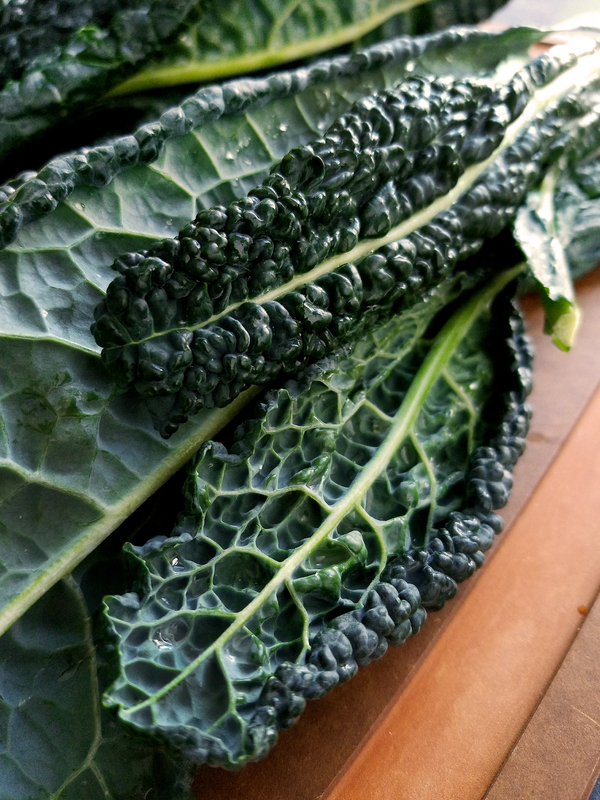 Now, personally I love kale; raw, steamed, sautéed, roasted, boiled, but the majority of people need a little help getting these nutritious greens in their diet. This dressing alone will do the trick. But why stop there? When people eat classic salads like garden and Caesar most people would say that the icing on the cake is always the croutons. Something crunchy on salads is always a welcome texture and I believe helps trick people into forgetting that they are eating a bowl of vegetables. So, without adding butter or oil-laden processed croutons I tested adding toasted breadcrumbs to the kale. The texture hit all the right points, all it needed was a bit of salt. 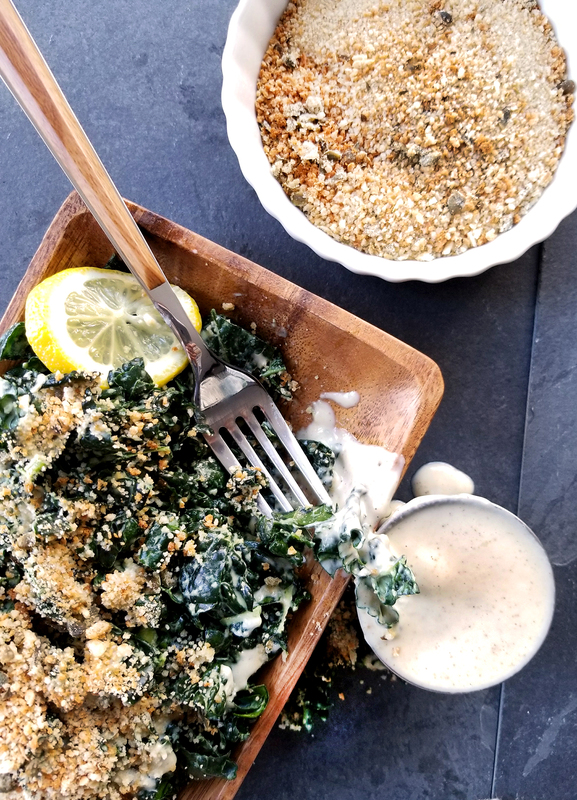 Rubbing chopped capers and a little raw garlic with the breadcrumbs created the perfect crunchy-salty topping to the chewy-sweet greens. If this salad was at my local deli I would not be surprised if it was the best seller. But fortunately, you can make it yourself, for far less and not get stingy with the dressing or the breadcrumbs! Slather on the goodness and try your hardest to share, because you will find yourself eating this from the bowl hunched over your kitchen counter, before it ever makes it to your dining room table. Finally, something you can feel good about stuffing your face with! 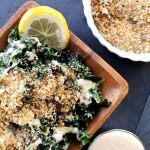 This deliciously addictive deli salad packed with dark greens and dressed with creamy-sweet golden raisin dressing, and topped with salty-crispy breadcrumbs. This sweet & salty savory salad will soon become a favorite! In a small bowl or jar place the raisins with the boiling water and set aside until soft, about 20 minutes. 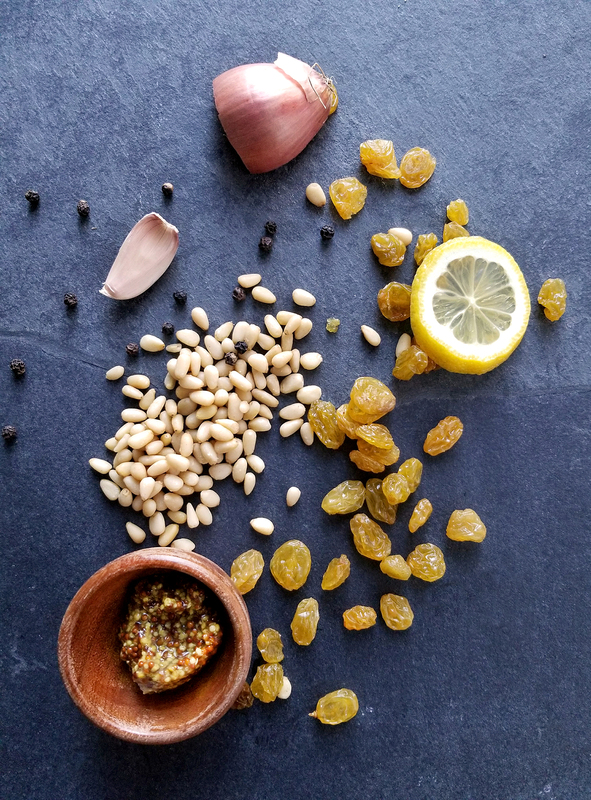 Add the raisins with the soaking liquid into a blender, add the pine nuts, mustard, lemon juice, vinegar, shallots, and garlic. Blend on high until smooth, about 1 minute. Remove stems from kale, and wash and dry the greens using a salad spinner or towels. Thinly cut the kale into strips. In a small bowl combine the breadcrumbs, garlic, and capers. Using your fingers massage the garlic and capers into the breadcrumbs, so the flavor is spread out evenly. Place onto a small baking sheet lined with aluminum foil and broil for 1 minute at a time. 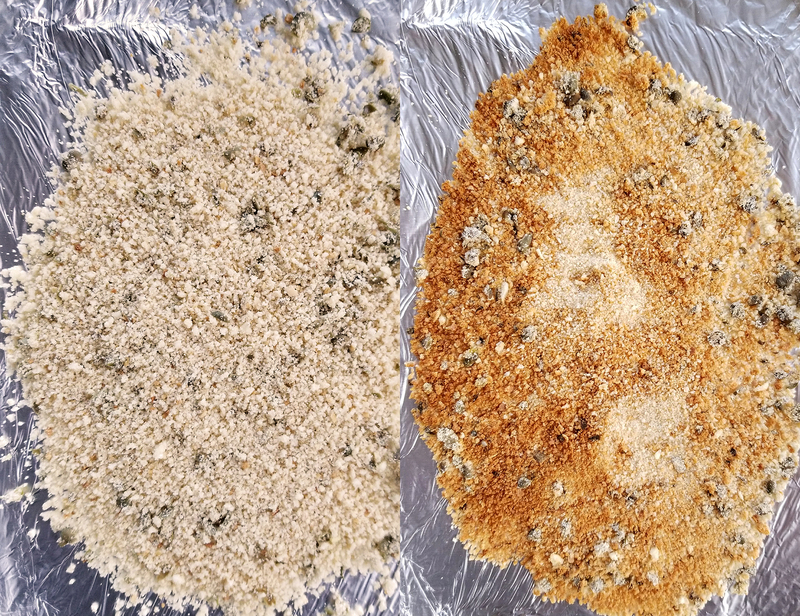 Each time agitating and mixing the breadcrumbs around until a golden color is reached (1-3 minutes depending on your broiler). This will happen quickly so do not leave your oven. Remove from oven and set aside. In a medium bowl add the kale with a drizzle of the dressing and massage the kale until the dressing is well coated. Sprinkle with breadcrumbs and serve. I prefer to use classic breadcrumbs because they don't have any added oil, but if that is not a concern for you feel free to experiment with Japanese Panko crumbs. 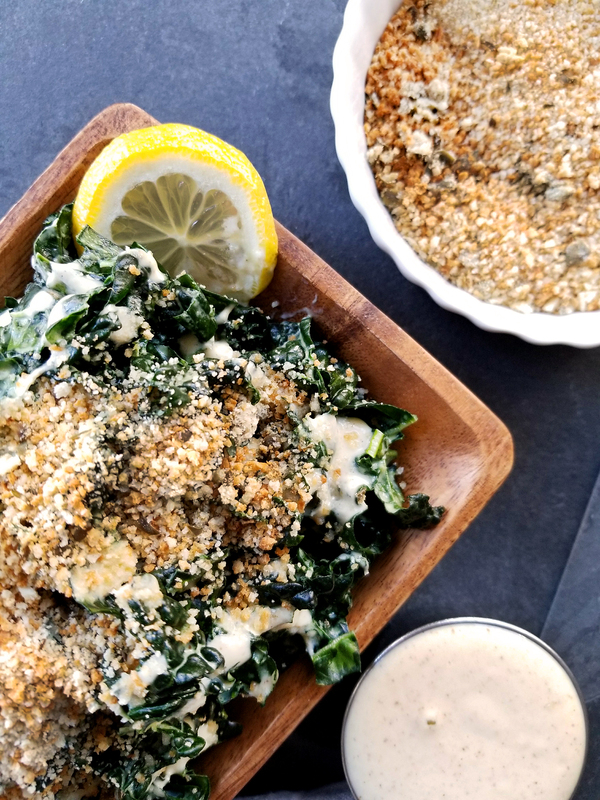 If you need the dish to be gluten-free you can omit the bread crumbs and just sprinkle the chopped capers on the kale or make your own with your favorite brand of gluten-free bread. This recipe makes about 2 cups of dressing. So, you will only need to use about half for one bunch of kale. Save the rest in the fridge for other dark greens or shaved broccoli, cauliflower, carrots, or another batch of kale! This is ridiculously good! The flavors and texture are so lovely, and the dressing is sweet in a way that doesn’t remind me at all of raisins. I can’t put my finger on it, but it’s delicious.